Xerox Color 800/1000 Presses deliver sharp, rich, digitally mastered image quality. Our clear dry ink station adds impact to documents – running at rated speed. Our Automated Color Quality Suite of tools allows you to drive more high quality jobs through your shop and reduce costs. Xerox® Color 800/1000 Presses deliver sharp, rich, digitally mastered image quality. Utilizing Xerox® low melt, Emulsion Aggregation (EA) Dry Ink and new fusing technology, Xerox® Color 800/1000 Presses bring you an even wider color gamut that can produce vibrant images with smooth sweeps that command—and hold—attention. 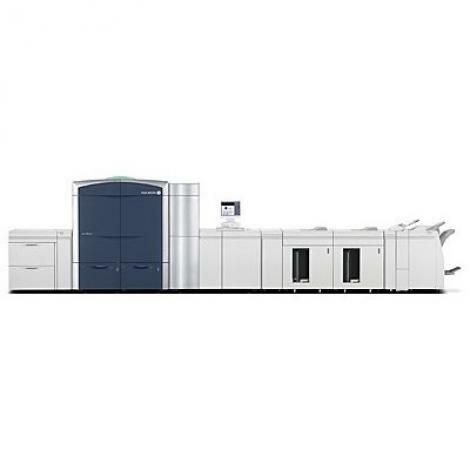 Running all weights at rated speeds of 80 or 100 ppm, Xerox® Color 800/1000 Presses deliver one of the widest ranges of media handling, from a lightweight 55 gsm to a hefty 350 gsm.